With increasing accuracy sniper zoom mod has become integral part of mods for each tanker. Now you can make a closer sniper scope x8 not as standard but much more on x30, which will be enough to see the enemy at long range and successfully make a shot. 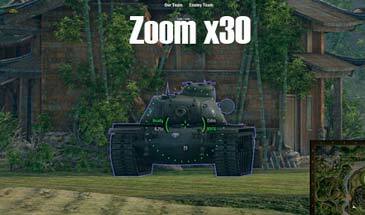 In addition, if the enemy tank is in the bushes, then the full х30 approach sniper scope make the leaves of bushes or trees a little more transparent, that will help you more accurately bring you gun to the enemy vulnerable zone.